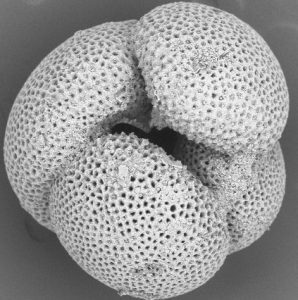 Foraminifera are single-celled micro (very small) planktonic animals (they eat plankton) with perforated (holed) shells made of calcium carbonate (CaCO3 i.e. chalk). Most kinds are marine (live in the ocean), and when they die, their shells form thick ocean-floor sediments. Planktic foraminifera (forams for short) live in the upper zone of the ocean. These creatures (indicating a period in geological time) are distributed worldwide, but found only in the open ocean. When they die, they settle to the bottom of the ocean. Planktonic forams tell us about past ocean currents and climates. Who Studies Foraminifera and Why? Marci Robinson and Xuan Ding are micropaleontologists who are foraminifera experts. While on the ship, their main roll is to determine the age of the sediments by identifying fossil forminifera in the core. They take a sample (about a 5 cm slice of the core) from the bottom (end) of each core that the drillers pull up. Planktic foraminifera species in sediment cores record the environment at the ocean surface. Each species lives in a certain range of temperature and salinity (the saltiness), so we can tell the temperature and/or salinity in the past by looking at which species were living there at that time. In the Bay of Bengal, the temperature doesn’t change much, but the salinity varies based on monsoon activity which can add a lot of fresh water to the surface through rain and river drainage. We look at the fossil foraminifera to see how monsoon activity (in terms of surface ocean salinity) has changed over time. Obviously, the deeper the sediments, the older they are. We can tell the age because we know when different species evolved or went extinct. We look for “marker species” so we know exactly where we are in time. At our first site, we recovered more than 350 meters of sediment that took us back all the way to the Cretaceous. That’s more than 65 million years ago – when the dinosaurs were alive. It’s always very exciting to be the first person to look at something that’s been buried for millions and millions of years. Once we get back to our laboratories on land, we’ll start analyzing the fossil forams for more information about the history of the monsoon. For now, we have to work really hard in 12 hours shifts around the clock just to keep up with the drillers! So How Do We Collect and View Foraminifera? 5. Once the forams are dried they can be viewed and using a light microscope or electron microscope (forams can be really small and often can not be identified with the naked eye).